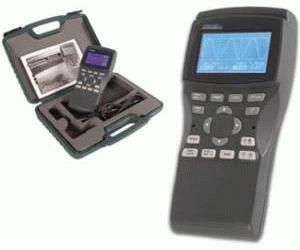 The Velleman Personal Scope is not a graphical multimeter but a complete portable oscilloscope at the size and the cost of a good multimeter. Its high sensitivity - down to 0.1 mV/div - and extended scope functions make this unit ideal for hobby, service, automotive and development purposes. Because of its extreme value for money, the PersonalScope is well suited for educational use in schools and colleges. Suitable for measurements on audio equipment, mains voltage applications, digital signals, all kind of sensors, signal analysis in automotive applications, car stereo, etc. Its full auto setup function, makes measuring waveforms very easy.